The exotically beautiful Caribbean Islands of Saint Kitts and Nevis, like most Islands in the Caribbean Sea, are lush tropical paradises. They have the kind of beauty that is commonly associated with the South Pacific. The atmosphere is luxurious and provides an inimitable blend of warm sunlight, clear blue seas, fresh, unpolluted air and wonderfully abundant vegetation. Officially the Federation of Saint Christopher (Saint Kitts) and Nevis, it is an independent island nation; the smallest in the Americas in terms of both land area and total population. The capital city is on Saint Kitts, which is the larger island, as well as the seat of the government. The federation of Saint Kitts and Nevis welcomes foreign investment and offers incentives to buy Saint Kitts real estate in designated areas. Non-nationals are exempt from the 10% alien landholding tax if they buy property in the Frigate Bay and Turtle Beach areas. The purchase of Saint Kitts real estate in designated areas makes the Caribbean real estate investor and their family eligible for ‘economic citizenship’. Property financing is easily available from all the major financial institutions on the Islands for foreign investors. Loan applications are approved under international lending guidelines and banks usually require a 20% down payment of the total cost, proper appraisal of the property and proof of your income in the form of a letter of employment or a copy of tax returns. St. Kitts real estate is relatively affordable, compared to the rest of the Caribbean. Condominiums start at around $350,000 and single family homes – ocean front – start at about $500,000. Freehold: The average price of government land is US$1.50/sq ft (Commercial), and US$1.11/sq ft (Residential). Lease: Land at the Industiral Site can be leased from the Development Bank of St. Kitts & Nevis at US$444.00/acre annually. Longterm Lease: The tenure period is 35 years and rent is reviewed every five years. Additional details should be sourced directly from either or both or your legal, real estate or local St. Kitts & Nevis related Government Ministry. This information is subject to change without notice and you are responsible for your own verification of the details of such land ownership in any transaction that you might undertake. Whether you’re seeking to vacation or simply want to purchase Saint Kitts real estate as a second home, you can’t go wrong on this incredible island paradise. St. Kitts and Nevis rank among the most beautiful of the Caribbean Islands, and offer a wide range of outdoor activities. The tall, volcanic mountains and lush forests are perfect for hiking and the inviting blue waters for swimming, sailing, fishing, and diving. The best white sand beaches on Saint Kitts are on the southern end. The eastern side, facing the Atlantic has more surf, and the north has black, volcanic sand. Nevis has a number of smaller beaches. You can rent both mountain bikes and racing bicycles if you prefer to explore on your own. Both St. Kitts and Nevis have good trails with local guides available to tell you about the medicinal uses of native plants, the island’s history and culture, and local flora and fauna. Most hotels will make arrangements for horseback riding including beach riding or riding through the rain forest. There are also twelve races annually at the Indian Castle RaceTrack on Nevis. Waterskiing takes place at Frigate Bay, on the Caribbean side and jet skis are available for rent; boards for windsurfing are also easily available. 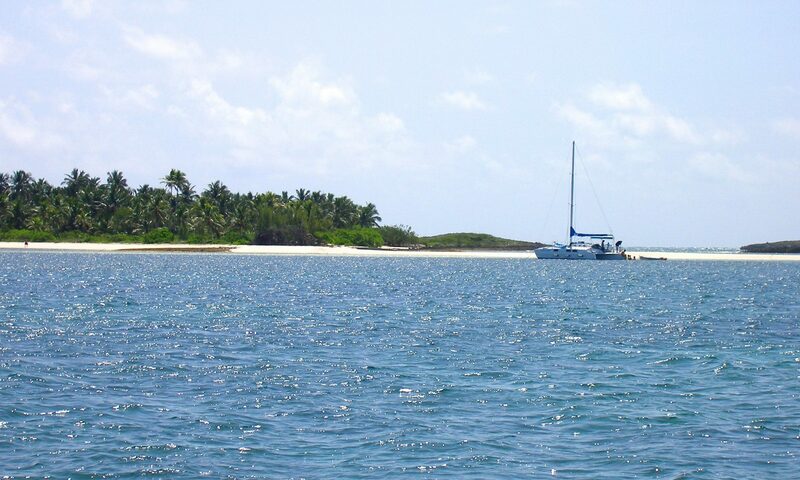 Boating, cruising and sailing are popular and these Caribbean Islands offer spectacular views. Snorkeling and scuba diving are relatively new on the Islands, and the coastal waters have dozens of unexplored shipwrecks. Careful conservation efforts have attracted serious game fish to the waters surrounding Saint Kitts and Nevis, making sport fishing an attractive option. Both St. Kitts and Nevis are tropical and the climate is tempered by the northeast trade winds. There is very little daily variation and temperatures range between 70- and 85°F – the average is around 80°F. The moderate temperatures are the main draw for Caribbean real estate investors and snowbirds. Temperatures also vary with altitude, and higher elevations have cooler temperatures. Humidity is usually around 70%, and the constant northeast tradewinds always keep the Islands cool. Annual range of rainfall is around 100 to 300 centimeters (40–120 inches) and neither of the two Islands has a distinct rainy season like the other Caribbean Islands. Winds speed hardly ever exceeds nineteen kilometers per hour except during the hurricane season, which lasts from July to September. St. Kitts and Nevis are located in the northern Leeward Islands in the eastern Caribbean Sea. They are about 19 degrees north of the equator, and are separated by a channel of two miles of water. They are about one-third of the distance from Puerto Rico to the Caribbean Islands of Trinidad and Tobago, at 7° 19″ North, and 62° 45″ West. St. Kitts is 23 miles long and five miles at it’s widest, with a total area of 68 square miles. Nevis is smaller and to the southeast, 7 miles in length, and covers about 36 square miles in area. Daily flights are available from the U.S. from San Juan as well as through the British Virgin Island of Tortola. There are weekend flights from Miami and direct flights from Philadelphia, Dallas and Fort Worth. From Britain, weekly charter service is available to the island from London’s Gatwick airport. There is also a cruise ship terminal and a marina for yachts in Basseterre. Once on the Caribbean Island of Saint Kitts, you can take a scenic railroad tour through portions of narrow gauge railroad once used for the sugar mill. Taxis and buses are abundant on Saint Kitts but fares must be negotiated upfront, with special attention to whether it is in EC or US dollars. Temporary driver’s licenses are easily available and there are several rental agencies. Microbuses are the public transportation and much cheaper than taxis. Tipping is 10 to 15%, and some restaurants and hotels add a 10% gratuity. Porters and bellhops usually get 50 cents a bag and taxi drivers get 10-15% of the fare. Beachwear is not appropriate in the towns, shops or restaurants; and very short shorts, bikinis and bare chests are not welcome in these places, either. Informal, yet conservative clothing is the expected norm. The official currency is the Eastern Caribbean Dollar, but U.S. Dollars, traveler’s checks and most major credit cards are accepted everywhere. Around five thousand years ago, Arawak and Carib Indians settled on the Caribbean Islands of St. Kitts and Nevis. By the time Christopher Columbus arrived in 1493, both the Caribbean Islands had substantial Indian settlements. By the beginning of the 17th century, the original inhabitants had been eliminated by Spanish attacks, diseases brought by the Europeans, and forced labor on Spanish pearl diving projects. According to legend, Columbus named the larger of the two Islands St. Christopher, after the patron saint of travelers, which British sailors shortened to St. Kitts. The Caribbean Islands’ unique visibility and position made them common landmarks for the first Trans-Atlantic navigators. Nevis derives its name from a shortening of the Spanish phrase ‘Nuestra Senora del las Nieves’ meaning Our Lady of the Snows – since the permanent cover of white clouds over the central peak seemed like a snow cap to the Spanish sailors. Colonization of the Caribbean island of St. Kitts began in 1623, when Sir Thomas Warner arrived with his family, and fourteen others to settle in Sandy Point and Old Road Bay. The French settlers joined the English in 1625 and as St. Kitts & Nevis became prosperous, warfare between the French and British began to be an almost regular occurrence. The French drove the British from St. Kitts in 1664, but lost it in 1689; they captured it again in 1706 and lost it to the British again soon after that. Finally, in 1783, the Caribbean Island of St. Kitts was returned to the British permanently under the Treaty of Versailles. During this time, Nevis rose to become the best-known sugar colony in the Caribbean. 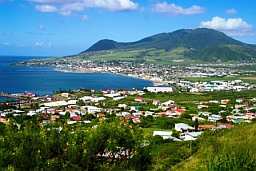 80 English residents from St. Kitts settled in Nevis 1628. By the beginning of the 18th century, the sugar industry had made Nevis an extremely wealthy Caribbean Island colony. Conflicts raged over the control of the island until the Treaty of Versailles settled the matter once and for all – in favor of the British. The Caribbean Islands of Saint Kitts and Nevis are two of the oldest colonized territories in the Caribbean. Saint Kitts was the first British colony in the West Indies, and the first ever-French colony in 1625, when the island was partitioned. Saint Kitts soon became the base for British and French expansion, and all the Caribbean Islands in the sector -Antigua, Anguilla, Montserrat, Tortola (British), Martinique, the Guadeloupe cluster and St. Barths (French) – were all colonized from here. Although only 2 miles of water separate them, the two Caribbean Islands have been governed as different states until the British unified them with Anguilla in the late 19th century. In 1967, Saint Kitts and Nevis, with Anguilla, became an associated state with internal autonomy. Anguilla separated in 1971 and St. Kitts and Nevis became independent in 1983, making it the newest sovereign nation in the Americas. Saint Kitts and Nevis is fond of musical celebrations like its Carnival, the St Kitts Music Festival, and the week long Culturama on Nevis. There are other festivals like the Saint Kitts Inner City Fest, Green Valley Festival, Easterama, Fest-Tab, and La festival de Capisterre. These celebrations feature parades, street dancing and music such as salsa, jazz, and soca, with calypso and steelpan bands and performers.